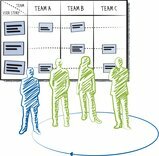 Some of your teams already use agile working practices. You ask yourself: How can I spread agile techniques? How do I scale agile for large organizations? How do I manage suppliers? How does agile leadership work? How to foster personal development while being responsible for team performance? Then wibas is the right partner for you. We have a long track record of supporting companies of various sizes in several industries in their change to disciplined and scaled agile delivery. Agile projects are significantly better. Nevertheless Agile does not spread throughout the organization on its own. Und dennoch verbreitet sich Agile nicht von selbst im Unternehmen. On the contrary: der Knatsch beginnt, denn Agile ist ein Kulturwandel mit vielen Barrieren.